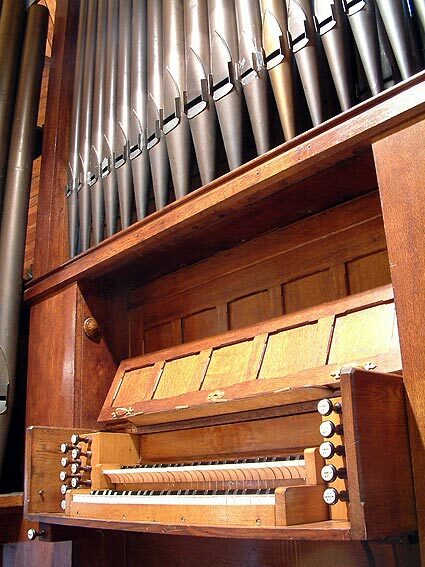 The organ in Shirley Road Uniting Church, Crows Nest, was installed by Joseph Massey of Sydney and opened in 1912. 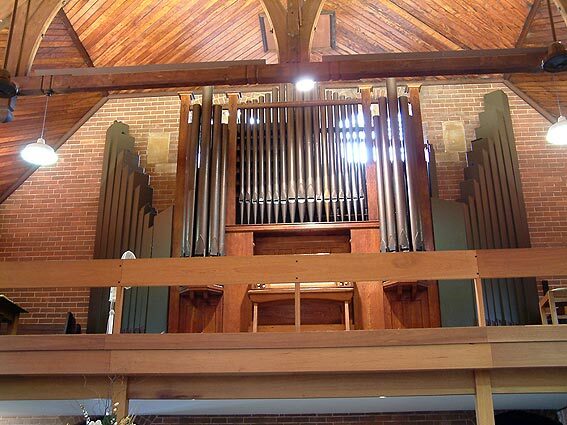 As well as being Organist of St Andrew's Cathedral, Massey was a capable amateur organ builder and a handful of his new instruments and rebuilds can still be found in suburban churches. An account of the opening of the Crows Nest organ can be found in Graeme Rushworth's Historic Organs of New South Wales (pages 380-82 and 424): here we learn that the instrument was assembled from earlier material, most probably English, and dating from as early as the 1860s. Although the recent restoration of the organ by Peter D.G. Jewkes uncovered a soundboard inscription bearing the name G.A. 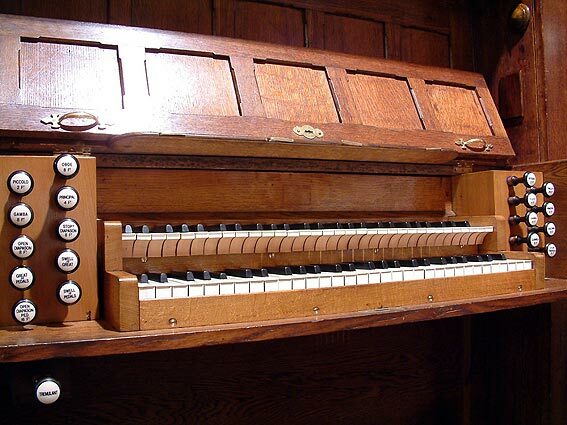 Berryman, research by John Maidment has subsequently shown that Berryman was almost certainly a London sound-board hand, rather than an organ builder himself, and an employee with possible connections to Gray & Davison. Thus the builder of the original organ remains a mystery. A detailed documentation of the organ was undertaken by John Stiller in July 1985 and this, too, pointed to the nineteenth-century origins of the organ, noting that most of the pipework stemmed from this time. 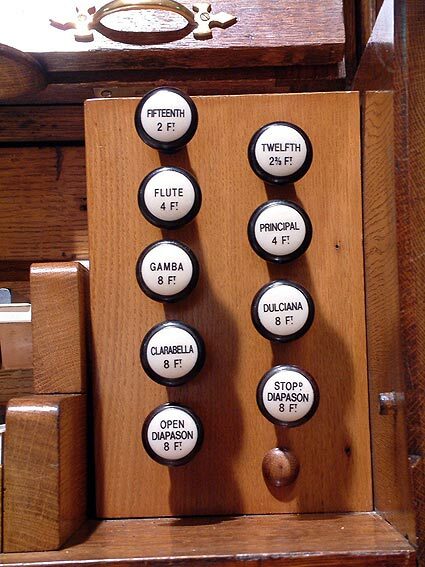 Stiller noted that only the Great Open Diapason and Gamba, Swell Gamba and Horn, and the Pedal Open Diapason, dated from the Massey rebuild of the early twentieth century. In 1969 a partial renovation was undertaken by Arthur Jones of Sydney and in 1970 D.R. Huggins moved the instrument from its original apse position at the front of the church to a new gallery erected at the other end of the building. In order for the organ to fit its new posidon some modifications to its layout were undertaken: these included the placing of the Swell and Great divisions side by side (necessitating the splaying of the Great trackers) and the placement of the Pedal Open Dlapason wood pipes in an angled row either side of the main case. Other changes carried out over the years include the removal of the hand blowing apparatus, the fitting of a new pedal board, the installaion of a tremulant, the painting out of façade stencilling, the lowering of the outer pipe towers (presumably to fit under the gallery ceiling), the removal of a builder's plate, the fitting of several new stop knob labels, and the probable conversion of the bellows from double to single-rise operation. Owing to the deteriorating condition of the organ the author was invited to make inspections and provide reports, firstly in June 1985 and again in May 1997. These duties were carried out on behalf of the Uniting Church (NSW Synod) Church Music Committee: they recommended that a full-scale restoration be undertaken. Owing to the high cost of this work and considering advice from some of the organ builders invited to submit quotations, no action was taken until 2001 when the church finally decided to implement a restoration project. 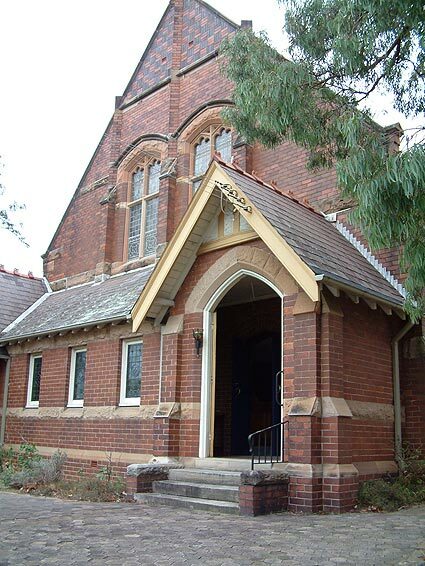 While unsuccessful in its application to the NSW Heritage Office for financial assistance, the church was able to benefit from the newly-introduced tax-deductable scheme developed by the Organ Historical Trust of Australia. Over $25,000 towards the cost of the work was donated through this scheme, the first to be instituted under the OHTA umbrella in NSW. (7) Supply of support rails in the form of "combs" to the splayed Great action: these are designed to stabilise the movement of the trackers and reduce friction and wear. 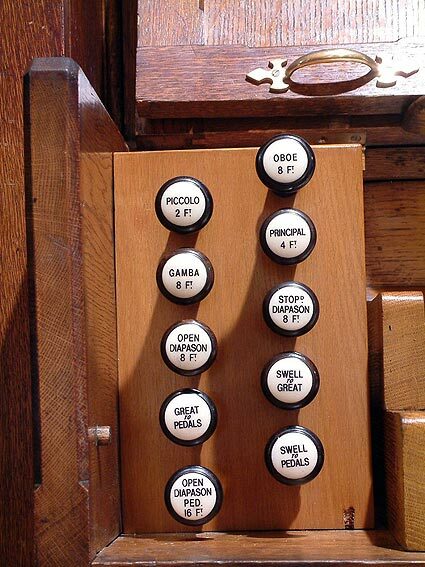 (8) Restoration of the console and the removal of unsightly switches to a wall position behind the instrument. (9) Provision of a new set of stop-knob labels in ivory resin, engraved to match the originals. (The restoration and retention of the original labels proved to be unviable, given both their poor condition and mixed origins). (10) Regulation and fine-tuning of the pipework. While the above work was carried out in an exemplary manner, and in accordance with the principles of the Pipe Organ Conservation and Maintenance Gulde, funds regrettably did not extend to the full restoration of the casework and pipe facade: the church has indicated that this could be a worthwhile project at some future juncture. It features a Principal chorus on the Great which is surprisingly complete for its era. In addition, excellent tonal qualities are evident in the various combinations, such as Great Clarabella with Flute, and Swell Stopd. Diapason with Piccolo. . . 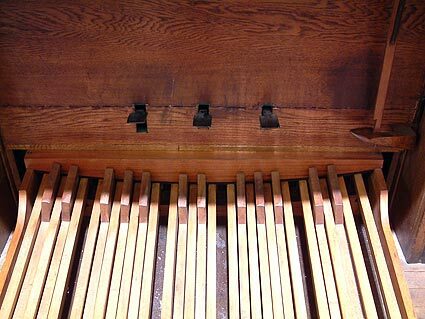 The musical and historic value of this organ is highlighted by the presence of a responsive mechanical action for the manual divisions, and the retention of many original console components. This instrument was rebuilt and installed in the church by Joseph Massey in 1912, originally by an unknown builder of the 1860s. It was restored by the Jewkes company in 2002, retaining an unoriginal small-scale pedalboard from the 1960s. Thanks to a recent donation, funds became available to replace the pedal board with a new normal scale board, made to RCO specifications, with Rock Maple keys and an American Oak frame to match the existing console furniture. The 1960s stool was also replaced with an adjustable Oak stool, to match the pedal board.